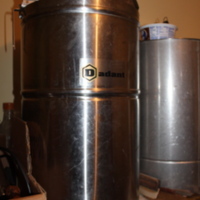 Stainless Steel honey extractor centrifuges. 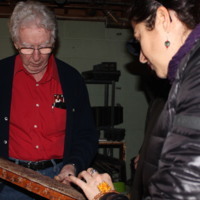 Fred Yarnell, beekeeper, looking at an old bee frame on a visit from Raíces Apiculture Initiative participants. 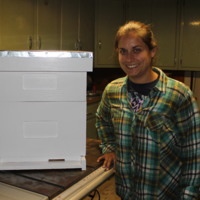 Bees moved over to their new home for Raíces Apiculture Initiative participant and supporter Susan Winkler. 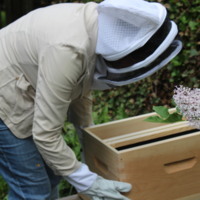 As part of the Raíces Apiculture Initiative, Raíces Co-Directors helped our friend and supporter Susan Winkler obtain and set up her first bee hive. 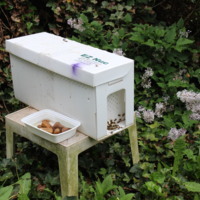 Here, Francisco and Sue are moving nuc bee frames into new bee box. 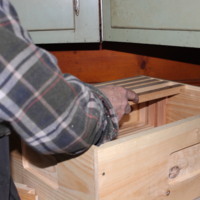 Susan Winkler, one of the first community members to contact Raíces regarding our Apiculture Initiative and to find out where to get her first bee colony and beekeeping equipment, preparing a new bee box for her bees. 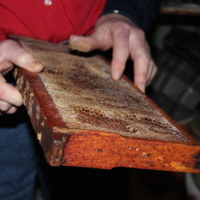 Raíces Co-Director Francisco is transitioning a nucleus hive into a friend’s new bee box. 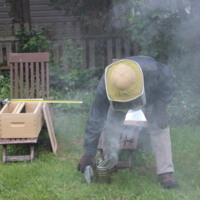 He has to smoke the nuc before moving the bees to their new home. 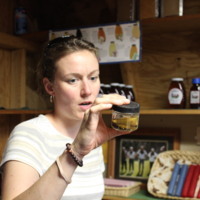 S & F Honey Farm tour participant Jennifer holds up a jar filled with dead mites that attack the bees in a hive. 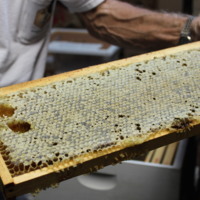 Presentation and tour participant Angela Lugo tasting some honey from a bee frame at S & F Honey Farm. 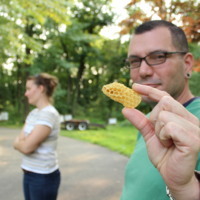 Enrique holds up a piece of honey comb for all of us to see on the Raíces Apiculture Initiative trip to S & F Honey Farm. 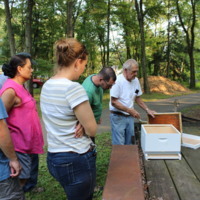 Stan explains the inner workings of a bee box to participants in his Apiculture presentation and honey farm tour. 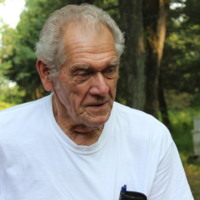 This is one of Stan’s bee boxes, he explains the entrance reducer he devised for his bees. 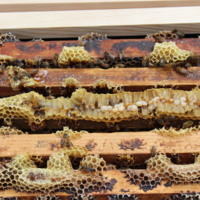 Raices’ first completed construction of a Langstroth bee hive. Francisco stands next to our first completed Langstroth bee box. 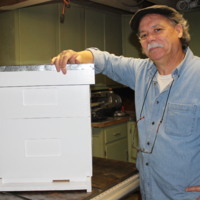 Nicky stands next to our first completed Langstroth bee box . 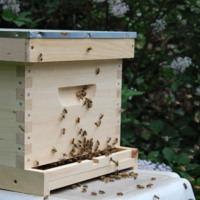 Raíces finishes construction of their first Langstroth bee box. 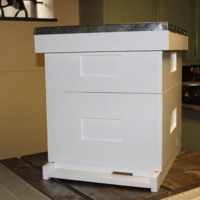 Unfinished Langstroth bee box and inserted frames. 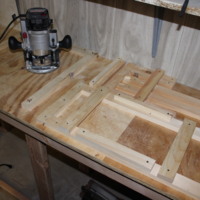 Sears wood router and a jig table for making bee frames and putting together the bee box. 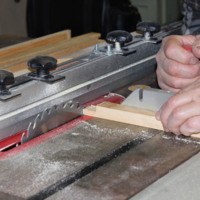 Cutting a bee frame slat to size on a 10” Sears table saw. 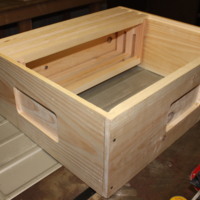 Unfinished bee box. 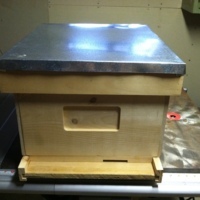 Inserting bee frame into box to check correct size.